We had a four day layover in Chicago and headed home to sleep in our own beds, snuggle with our dog, Colby, catch up with friends, and repack our suitcases for the long journey ahead. We headed to beautiful Sydney, Australia via Dallas, TX. We had a layover in Dallas which we spent in the American Airlines lounge and then headed to Sydney on a 15 hour flight on Qantas. Qantas ROCKS! Favorite airline so far this trip—and LAN in South America is in 2nd place—we loved them too. The long, long, long flight was uneventful—they fed us at regular intervals, I worked on the computer and did some blog preparation, and we slept off and on. At one point, Jared and I went and sat in an open bulkhead row just up from our seats so we could stretch our legs and let the girls stretch out and sleep better. When we were landing in Sydney, Lilli actually said; “awwwww….I don’t want to land yet—I like it on the plane!” What’s not to like if you are an 11yr old with unlimited quantities of snacks (Twix, apples, crackers), every kids movie you would want to watch, and your parents letting you do both with no restrictions. J We did exit the plane and cleared customs to head out into the warm summer Sydney morning. We picked up our keys to our apartment from a sleepy lady that we had clearly woken up (ooops–sorry!) and headed into the Erskineville area to check into our new home for the week. The apartment was fantastic—a two bedroom duplex unit with very modern furnishings—fitness room, swimming pool, and a washing machine! The complex was across from Sydney Park—it was great to run through, play at, and was a major dog walking park…so the girls could get their dog fix. When you pick an apartment off of Airbnb, most of the time it works out great, but sometimes you have little issues that can crop up. One morning, the breeze blew our bedroom door shut, which wasn’t concerning until Jared went to leave and he couldn’t get the door open. The latch apparently didn’t fit properly with the door frame and would not release enough to get the door open so we were locked in our bedroom. After several minutes of anxious jiggling of the door knob-examining the hinges, checking out the distance from balcony to ground—Jared pulled out his AAA card and released the latch. At SAU, I learned how to lock people in their dorm rooms with pennies…and luckily at Drake they learned the valuable skill of how to break into a room (and that’s all were going to say about that). We spent our days going to the beaches of Manley and Bondi—the girls preferred Manly because it had better waves for boogie boarding. I loved Bondi because we did the hike to Coogee Beach—a beautiful 5 mile walk along the coast with amazing ocean views, quaint coves, and plenty of sunshine, blue skies, and aquamarine waters. Coincidentally through Facebook–we met up with Sandra, William, and Jack Smith (Sandra and I served on the Make A Wish Associate Board together for several years) and had a great time! We attended a Waratah Rugby Match, which we all have caps from now because we were completely unprepared for the scorching heat in our sunny seats. Rugby is not for the weak of body or heart—it looked like a combination of American football, soccer, and hockey—but all without pads—ouch! The Waratahs were beat soundly by the Perth Western Force but that didn’t stop them all from showing up after the game to sign autographs for the kids—Lilli, Jack, and Isabella had a fantastic time getting their caps and flags signed by the players and TahMan—the Superhero mascot of the Waratahs. After watching the whole game, we still weren’t really sure what the objective or rules were—we need some Rugby schooling before the next match! 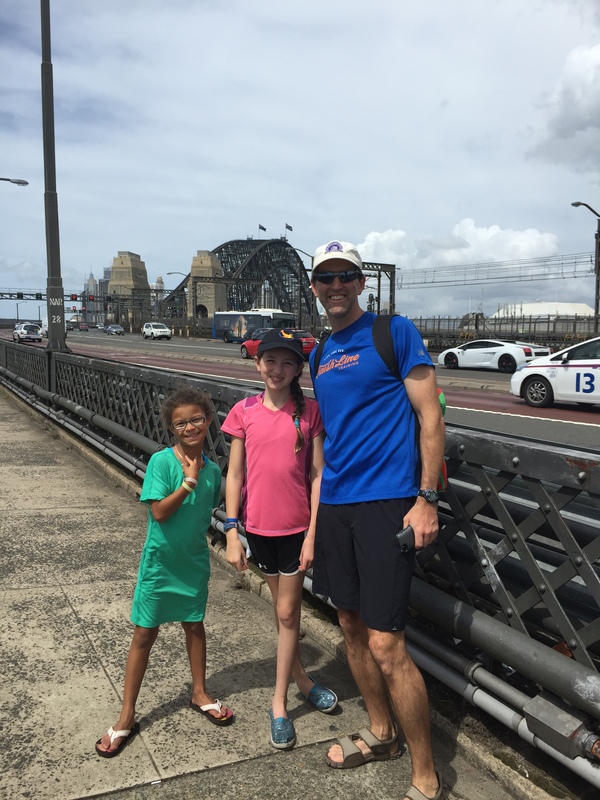 We spent the week riding the ferries, visiting the major sites like The Rocks, celebrated Chinese New Year, went to Taronga Zoo—and Lilli and I did the Wild Ropes experience—where we scrambled across two different courses high above the walkways of the zoo. Being afraid of heights it was especially strenuous for me—and never got easier the entire course. Lilli was flying through each of the challenges—climbing across nets, swinging on ropes, and walking on logs—the ends of them! It was crazy, fun, and terrifying all at the same time. We also got to know the city pretty well, riding the city transit train and ferry system every day. It is a good system, but took us a few days to understand which trains were going in which direction. One day the trains were not cooperating and we ended up about 5 stops too far out of the city, thank goodness that Uber worked in Sydney to whisk us home. Sydney is an easy place to be—very beautiful with all of the water surrounding the city and beautiful parks and greenspace. There are a few places along the way that we said we could live in—Sydney and Australia in general is one of them. The lifestyle is good and families seem to enjoy spending good quality time together. Check out our next blog on New Zealand……. Wow. Looks like a ton of fun. Looking forward to your next update! (I’m taking notes..) Enjoy. What an exciting trip! Looking forward to reading your next update.